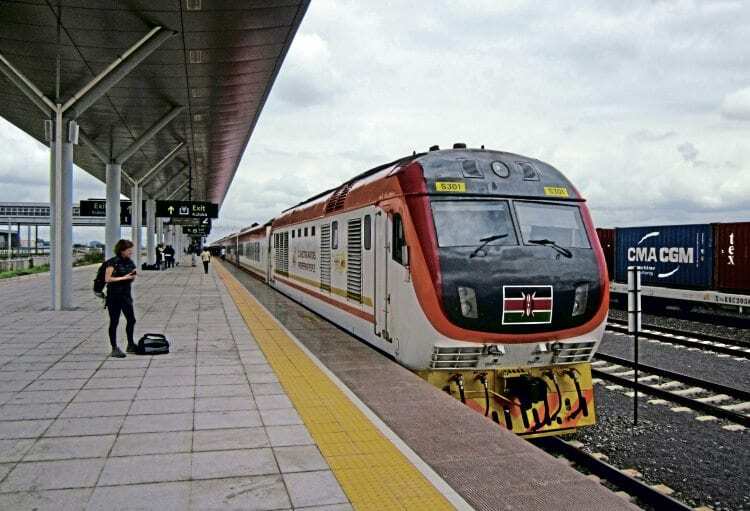 THE new 472km standard gauge line that opened in Kenya between the Indian Ocean port of Mombasa and capital Nairobi on May 31, 2017 is celebrating its first anniversary, just as ambitious plans to extend into neighbouring Uganda get underway. The new line, which was built in just 30 months at a cost of US $3.6 billion, opened to passengers on June 1 last year and has carried more than 610,000 passengers in its first six months. Freight has been carried since January 1, reducing transit time for containers from Mombasa to Nairobi to just over eight hours. Passenger trains between Nairobi and Mombasa run daily – known as The Madaraka Express (Madaraka is a Swahili word meaning power and used to celebrate Kenya’s independence day) – currently consisting of 12 coaches, including a dining car and two First Class coaches (each seating 72 passengers); the remainder are Second Class coaches with 118 seats arranged in a 3+2 configuration. Maximum speed for passenger services is 120kph, although in practice trains operate slightly below this on high-quality track, with journey times of 5hr 50min from end to end. Next Post:US Government to ban Chinese made trains?